There’s nothing quite like a good, old-fashioned fishing trip. 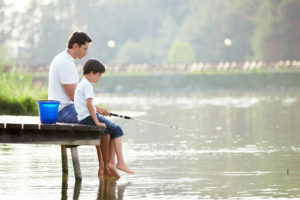 Not only is it relaxing to be out on the water or on the water’s bank casting a reel into the deep, blue beyond, but it’s also a fantastic bonding experience that draws you closer to the ones you spend it with. No matter how many fish you actually do catch, there’s no denying the fact that you’ll make memories that will last a lifetime. little daunting, but we’ve created a little guide that should help you along. Follow these steps, and you’ll be fishing in your dream location in no time. Sure, you could drive up to a random body of water and sit for days hoping something would bite, but who’s to say there’s any fish there in the first place? A good fishing lodge will usually be placed next to water that is stocked regularly with some of the best fish available, so if you’re a relative beginner, or just want to spend the night indoors instead of a tent, read up on some reviews to find the one that best suits you and your gang. Or, if you’re up for a real adventure, head off the beaten path and find water that few others have found. You may not find much of anything, or you may find the catch of a lifetime. In years gone by, you could get away with simply showing up to a lake with a few worms and hoping for the best. You might not catch anything, but there wasn’t really a lot of other options, so you had to make do. These days, not only is there a plethora of baits on the market, but there is also bait that is tailor-made for a certain species of fish. If you want to catch bass, you better show up with something that they like to nibble on, instead of regular catfish bait. Do some research on the spot you’re going to ahead of time to find the right one to suit your needs. The same goes for your rods and reels too. Make sure the equipment you bring is appropriate for the type of fish you want to catch the most. Before you actually go out on the water, take some time to get your tent set up in the right location, hang the food up out of the way of bears and other wildlife that may want to munch on it, and get the supplies ready for a fire. Chances are, you will be exhausted when you come off the water, so make life easy on yourself and your crew by getting your gear stowed once you arrive. Once you’ve got your gear stashed on the campsite, it’s time to get on the water. 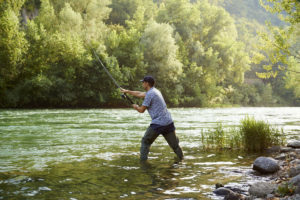 If you plan on fishing from the riverside or from the lakeshore, all you need to do is pull up your boots and approach the water’s edge, cast your line, and get going. If you’re fortunate enough to have a boat (or have a friend that does), you’re in luck. Standing on the shore is nice, but there’s nothing quite as relaxing as being on the open water and casting out into the deep. Not only will you have an easier time catching your dream fish since you’ll be more in their territory, but you also won’t have to fight the moss and grass that pools up by the edge of the water. Many a fisherman have lost their bait to undergrowth right next to their shoes. Don’t forget what you’re there for: to make memories and have fun. At the end of the day, the amount of fish you catch will pale in comparison to the conversations you share around the campfire and the laughs you share as you watch your newbie friend struggle. Try to relax and enjoy the moment.